As a long time gamer over the years, I’ve bought into a couple of products that never delivered or fell so short of the mark at release it was like playing a beta. 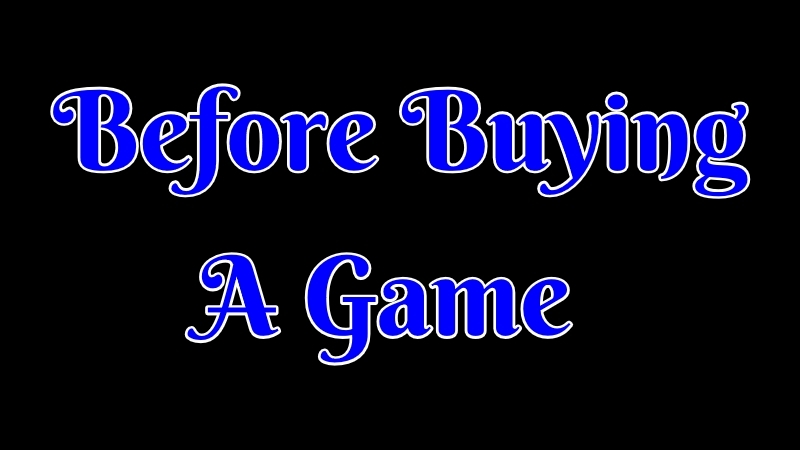 With how a lot of games are being funded these days that is the risk you take into buying games in alpha, beta, early release, and any other early access tags they want to give themselves. This is tenfold when you are dealing with a first-time game developer that can submit any game they want to a platform. Most times these things can be avoided by finding good trusting sources and doing your own research. Along with maintaining your own hype and not giving into fear of missing out when it comes to the latest games. Just because your friend is yelling how amazing a game is at the two-hour mark in discord does not mean ten hours later he or she will have the same feeling about the game. While really bad games are easy to spot and get called out it can sometimes take a while before people fully realize how good or bad a game really is. For many people, this all comes down to what kind of risk they want to take on. Are you more about supporting the game developer regardless if the game ever comes out or are you more looking for a full released polished product? Best Games Are Older Ones! I personally believe some of the best games to play out there right now have been out for years! Those games have had time to iron out the bugs, add in more content, and they go on discount. Sometimes entire modding communities have been created around that game taking it to a whole new level. This does not work for every game like the ones that require an active player base that has since died off. Many single player games just turn into masterpieces over time along with some online games as well. When I tell people I bought No Man’s Sky their first reaction is “that should teach you about preordering a game.” Except did not preorder it. I bought it at like 4 am or some crazy hour the day after release at full price. My friends would not shut up about how amazing it was and that new feeling soon wore off a few more hours in. There nothing like seeing a game to go on sale to feel like you finally got the game you paid full price for and could have just waited and saved money. The game needed some time to mature and it sure has since then. I’m sure you have seen it before “this game is in early access” or “this game is in beta. First off you need to know that not all games make it to full release. They could run out of funding or get into legal troubles. Heck, it could just be one guy making the game as a hobby. Maybe the lead developer who wrote 90% of the code found a better job and left the project. When you’re dealing with an unfinished product you are taking on more risk than a fully released game that has been out for a while. As such I recommend if you are buying into the more risky phase of a game find ones that if the game developer said tomorrow “the game is now fully released.” You would be happy with that purchase. Same games will sit for year after year after year in alpha or beta. If it takes them five to ten years to get out of beta will you still be playing that game you bought? Doubtful. So you might as well be buying something you can enjoy now. Ark Survival Evolved more or less did that. They kept adding in so much stuff towards the end before going into full release. You were more or less already playing the full game. The core mechanics for the game were done years prior. You just got a bunch more dinosaurs and some end game content towards the end. Along with some bug fixes and optimization as well. I more or less stop playing the game once it went full release. I was at over 1k hours played I already enjoyed it! Sometimes a game not only will never make it to release but it was a pile of garbage and the game developer abandoned the product after raking in some money. I once bought a game called StarForge because a buddy of mine told me “this game has huge potential.” I have three hours played most of which were trying to get it working. This was back before you could return a game more easily so I knew my money was long gone on that early access. It was so bad after years of people calling it a scam. The store page was finally removed. It was broken to the point nothing worked. There was almost nothing in the game with only the starting area having something to interact with. Rest of the map was empty, buggy, and broken. The game developer kept claiming things were moving along. Heck, they even tried to tell everyone the game was not only on version 1.0 as if it was in full release or something. But more things were coming soon. The game went on sale so often you almost could not find a point in time it was not on sale. Long after the developer was even trying to make the game or “patch it.” I was in shock how long it was allowed to be listed for sale. Despite on the forms people spammed “this is a scam don’t buy it.” People would buy it and then write a glaring post about how they just got scammed and are trying to get a refund! Well, it helps to look into things before impulse buying. Call me crazy but you might someday find a project so amazing you just want support it regardless of the outcome. Maybe the game has a short demo or maybe they're just something about it that you are like “take my money.” Accept those pipe dream kind of games to never go anywhere fast. Mine for me is a game called Hellion that I bought back in 2017. It’s still in development and frankly, I expect it to be for a very long time. Back then what I believe to be the sole developer of the game was extremely active in his own game forms. Talk about a guy who has passion and loved what he was creating. The game itself had some amazing detail for what little at the time was in the game. I recall the starting ship and some of the starting modules to build a base out of. It just felt worth slapping some money down on it. I have 13 hours played total and I’m going to wait a while before going near the game again. The developer still almost puts out weekly updates on what is being worked on or patch. Development is still moving along but as I expected very slow. I knew what I was getting into before I bought the game. If nothing comes out of it I’ll be fine with that. I had an amazing couple of hours for the few of bucks I paid. These kinds of games also get to have the excuses that it is just early access. Everything can change. Everything can be broke. It could be months between a playable game from one patch to another. On top of that many games get a fresh start and full server wipe on release. The biggest issue is you fall in love with the game that’s not going be like that at release. Many get into an early access game because they love just how it was at the time of purchase. Then the developer patches out, adds in, or changes how something works. Suddenly that game is just no longer something you enjoy. Game versions also have a chance of not working with the newest update. I’ve had it happens so many times where I’ve had to start over in a game. The latest patch breaks any old save game files and instead of trying to make it backward comparable. Development of the game is just moving forward as after all that is the developer's primary goal. You just lost everything and there nothing to be done about it. You also could log in and have 5 FPS despite the fact that last night you had 45 and they had a patch since then. When will the FPS get fixed? Well, they are busy developing the game and you are just a beta tester. Things get fixed when they can so maybe next patch. That could be days, weeks, or months down the road. Then you have the classic you want to play that early access game expects servers where taken offline for 3 to 6 months. Perhaps you bought in during a testing phase that lasts a month or two. Now you’re hooked and want keep playing. Well, that is just the life of a beta player. Companies are not always going to keep a game online or in a playable state during alpha or beta testing. This is possibly the worst time to buy or try playing a game. The server can’t handle the traffic despite efforts to be ready. There where glaring bugs missed despite robust testing. Development teams don’t recall the last time they have seen sunlight and desperately want to go on vacation. So many are contacting support you are not going a reply back for a week(s). On top of that, it could get delayed on release day. If a game sells 1 million copies in the first 24 hours including presales how likely is it they have the server capacity for 1 million active users? They don’t and despite what they say they never had plans to in the first place. You see in a couple of weeks this is no longer going be an issue. If they only expect to have 50k active users during peak hours weeks later it would be stupid to spend money on the infrastructure to support twenty times that. Many often want to ride the hype train into the release day. I’m guilty of this myself. You have been waiting for that game forever and finally, it’s here. So you take a few days off to enjoy it without life getting in the way. Expect you are more than likely to spend it watching log in ques, for servers to be taken offline for patching. Along with those massive day one patches bigger then the game pre-download was. What a great way to spend the time you took off! This is also when development teams have been working around the clock to get the game ready and released. They have worked weekends, given up personal time with loved ones, and are burnt the heck out. They just want to get over that hurdle of a release with what adrenaline they can muster. Many of them might be getting ready to move to another project or let go as their job is now finished once the game is good enough. Some games also release with glaring bugs that were reported months ago. While others were thought to be fixed but a patch fixing something else broke things. 10,000 people testing a game is nothing compared to 200k people playing. On top of that some players to hold onto the bug(s) they found to exploit it for the big day and have fun. You also have the reality that games get delayed sometimes just hours before the release. That delay could be hours, days, weeks or even years. There was this one game I wanted to play in 2017 it even had a release date. It got pushed back a couple of times when it was going come out in 2018. Well, it's 2019 and there no hint of any releases date. People are already speculating it's going be a 2020 release. Sometimes when a game gets delayed that opens the doors for “well since we got some extra time now. . .” Years later they are still putting out updates about new things they have added. If you really want to enjoy a game and are considering taking time off wait a couple of weeks. Hopefully, by then any delays where only short term, bugs where fixed, the servers are no longer overloaded. If those things are still going on you might luck out and either changes your day off or make arrangements to enjoy something else. Thankfully in this day and age, you have an almost unlimited supply of game reviewers out there. No longer are you stuck with just the opinion of a couple of people on some fancy website. You can find reviews in all kinds of formats: video, written and podcast. Some of them will be creating short-form content and others will give you a massive overview of the game. These people can be a great source beyond what PR a game developer is posting on their website. However, you do need to keep a few things in mind. There is always a massive fight to get those clicks and all that traffic on day one of a release for any major title. If you are wondering how someone gets a full review of a game out one hour into a release its simple. They either had access to the game beforehand, are solely going off game press information or they are just winging it. Many large game reviewers will be granted access to a closed beta or go about acquiring it for themselves. They want that day one review and companies want them to be promoting their game on day one as well. It’s a win-win for both of these parties but not always the consumer due to the fact how much hype tends to be around a game at release. Impulse buying on day one is an easy trap to fall into as well when you hear the smallest of news that it was amazing. You might have also noticed a lot of the big publishing websites out there for game reviews all have the same exact screenshots. Game companies tend to have a media press release of screenshots, written up talking points, and give other details. All of which is free to use for those game reviewers. That is the point after all. You want to find people creating their own content and not someone just pushing whatever is dropping into their lap. Not all game reviewers are treated the same. I remember once a reviewer I was watching on YouTube a few years back was promoting some pay to win game. They had the best gear in the game and all in-game unlocks. Due to the fact, the game developers handed them a fully loaded out accounts to play for their review and videos. That is not how the normal consumer is going to enjoy a game and something to look out for. You also have many getting out any firsthand experience they have day one. Gamers in the first few days of a new release are so hungry for ANYTHING. You have to remember those experiences and what they have to say about the game could just be based on the first couple of hours of gameplay. It’s tempting for a game to be very polished in those starting areas where everyone starts out in to create a great first impression. When it comes to first-day game reviews you should really treat them with a grain of salt. You need to think for yourself and see if any hints are given by those writing them. Did they receive early access and things have since changed? Did they pay for it themselves? Are they using their own screenshots or do they appear exactly the same as a bunch of other reviews? Did they acquire their own first-hand experiences or was it given to them? Does the game review look like it’s based off a few hours of gameplay or much longer? These are just some of the things to consider. Game reviewers tend to get a lot of hate and while some of it can be deserved many times it just boils down to a difference of option. People tend to have things they go over the moon for in games and other things that just drive them nuts. Finding someone who has a similar taste in games as you do is a great way to find new stuff to play. While you can suffer from echo-chamber syndrome doing this it can be like having that guy who knows what games you like as you share similar taste. It can also be beneficial to take a look at differences of opinion and see if there are any legit concerns. Sometimes people are going hate to hate and get those views. While other times they either notice something or are not blinded by a certain bias. A good reviewer will want to make sure his or her audience understands their point of view. If there could be any conflicts of interest or bias in the review. There are people out there will call them a sellout or dismiss the review entirely. It’s more about earning trust and building up a long term viewership and not an overnight fling. Did they receive the product for free? Where they paid or given other kinds of compensation? Are they linking with a referral that gives them a kickback? Was there an agreement/contract for hire? Is there best friend the CEO of the game they just did a review on? There are a bunch of things to consider. More times than not for the smaller reviewers out there these things don’t happen. As such there no reason for bringing them up as there is nothing to disclose. However, if you happen to find out later they don’t bring these things up when they happen that is something to be mindful of. What else are they not saying? Sadly some will sell you a pile of garbage if it comes with a $10k check. I’ve been lucky to only have been burned on a couple of games in my life. I even have played a few early access games and regularly enjoy them. It’s all about making sure what you are buying is in a playable and enjoyable state. It is supposed to be fun after all playing them for the most part. Along with not buying into the hype and letting things cool down so they can mature and become a better game. Whenever I don’t things sometimes don’t work out.